Love yourself beyond anyone or anything else. Love yourself so much that you cant do anything that doesnt make you love yourself more. •Everything is energy. •We must direct energy. •If we dont create for ourselves, we become created upon by others •Our highest intention is to remain BALANCED and in Divine Love. 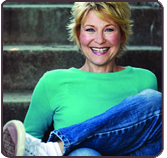 Dee Wallace jumped into fame after the box-office hit “E.T.” Almost 29 years later, shes sharing her career experience and lessons learned. Starring in 130 movies, Wallaces role as Mary in “E.T.” left a lasting impact, defining American cultures view of motherhood for a generation. In addition to her ongoing work with fellow actors as an acting teacher and mentor, Dee devotes all her extra time to her beautiful daughter Gabrielle. Join Georgiann and Dee for an hour of Conscious Creation.